Hey Team Thunder! Do you and your family have "pumpkin art" that you would like to share? E-mail your photo to me at rippolito@gmail.com before 10:00 p.m. on Sunday night so we can display it on mrippolito.com! Yesterday and today, we all became amateur archaeologists as we sifted through artifacts from the Maya, Aztec, and Inca cultures. Students created some AMAZING artifacts! In this video, students are documenting each artifact they find. We want Halloween to be safe and fun for all Rio Norte students and staff this year. Here’s a great way for you to follow the rules, and enjoy this year’s Halloween celebration on Friday, October 29. 1. No masks may be worn. A mask may be brought to school for the costume contest at lunch and may be worn during the time of the contest only. Masks worn at any other time will be confiscated. 2. All costume clothing must conform to the dress code. 3. Flip-flop sandals and appropriate pajamas may be worn as part of a costume. 4. No spikes, chains, or ropes may be brought to school. 5. If you choose to dress in a sports theme, no baseball bats, hockey sticks, golf clubs, etc. may be brought to school. Also, no cleats may be worn. 6. No weapons of any kind, real or fake. To bring even a fake weapon to school—even on Halloween—can still be an expellable offense. 7. Make-up, hair dye, and hats are permitted, as long as it is not dangerous or disruptive. 8. Finally: No costume may be worn that will prevent you from learning and fully participating in the day’s activities. It just started two months ago so I didn't even know about it, but you can now use Fast Follow from Twitter! This means you do NOT need to sign up for a Twitter account in order to get cell phone updates sent directly to your cell phone. Simply send the message follow mrippolito to 40404. And you're done! You will now receive Mr. Ippolito's class and homework updates sent directly to your cell phone with NO TWITTER ACCOUNT REQUIRED! It's amazing! If you get sick of Mr. Ippolito's messages, simply text the phrase unfollow mrippolito to the same number and that's it! Of course, standard text message rates apply. This is cool! Click the link below to play the game the Maya and Aztecs played! Twitter is a powerful tool for staying connected with the friends, news, and resources that matter most to you. Adults are using it for professional and social connections, college students use it to stay connected to professors, and you and your family can use it to get instant information about Rio Norte Junior High School. Mr. St. Peter (the Team Thunder science teacher) and I are also posting regular updates to twitter so your family can stay connected to what's going on in the classroom. You can even get these updates sent straight to your cell phone the moment they're posted! I have posted two resources to help you. The first is "a parent's guide to twitter," designed to help you better understand what twitter is all about. I then posted a step-by-step tutorial for creating a twitter account and linking it to your cell phone. Just like Google, Yahoo, Bing, or any online resources you may let your child use, twitter is a powerful and useful tool that is also a window to the wide world, so it's important for parents to understand twitter before setting up an account. Sgt Bret McCauley, twice awarded the Purple Heart for his service as a US Marine in Iraq, came to speak to my classes today. He was seriously injured in an explosion from a suicide bomber in Fallujah in 2003. His message was that you can't control what happens to you, but you can control your reaction. 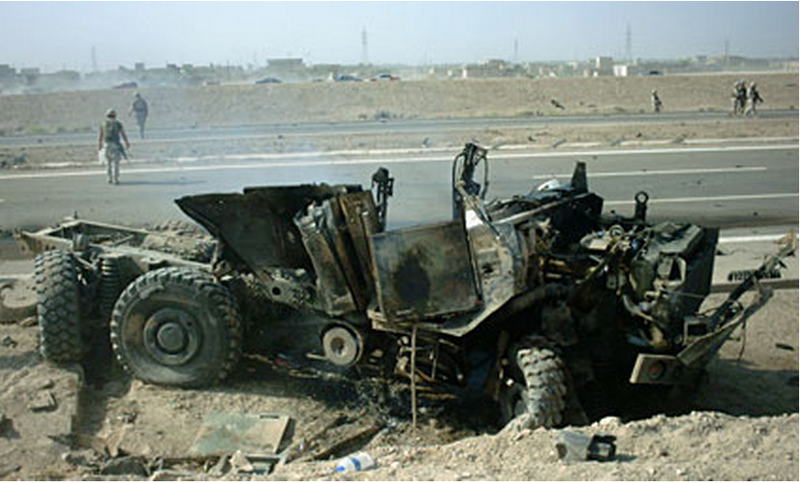 Here is what was left of the truck that Sgt McCauley was travelling in when he was injured. I'm sorry for the short notice, but I finally have confirmed that we will get a visit tomorrow from Sgt Bret McCauley, US Marine Corps. Sgt McCauley proudly served our country in Iraq, and received the Purple Heart for injuries received in the line of duty. I was offered the opportunity for Sgt McCauley to come speak to some of my classes, and because tomorrow is an E Day (39-minute class periods), and because we are ahead in our seventh grade history curriculum, I jumped at the chance. There is a slight possibility that Fox 11 News may come to my classroom to do a story on Sgt McCauley during Periods 2 (history), 3 (yearbook), or 4 (history), and again another slight chance that your child may appear on TV. If you have any objection to your child appearing on the local Fox 11 News, please let me know. If they do end up running the story on TV, I will post that information on mrippolito.com. This map might also help you with your homework. There really is no GOOD Maya map in the textbook, so here is a good map that gives you the locations of both the Aztecs and Maya. Happy homeworking! image. Here are each of those images. Send Halloween Grams to your friends! You can buy Halloween Grams for your favorite Rio Norte student now through Thursday, October 21. Each Halloween Gram is only $1 and includes a fun goody bag and your special, personalized message! All the money supports field trips for Rio Norte students. Buy them this week, and they will be personally delivered in homeroom next Friday, October 29. You can get one for each of your friends! On Tuesday, October 19, all schools in the Hart District are scheduled to participate in the Great Shake-Up Earthquake Drill. We will have a special schedule that day, but you will still attend all classes. Be prepared to be outdoors for 30-45 minutes. Wear comfortable clothing, and consider bringing a book to read. Today in history we transitioned from the Maya to the Aztecs. There are many similarities between the Maya and the Aztecs thanks to a process called cultural diffusion. Pay attention to what makes the Maya, Aztecs, and later the Inca SIMILAR and DIFFERENT as we continue our studies of Mesoamerican cultures. Another mystery of the Maya . . . ? Did Justin Bieber get the idea for his hairstyle from renowned Maya scholar Linda Schele? You be the judge, and have a great weekend! Tomorrow, Friday, October 15, is the end of the First Quarter. Will you please look one more time at your grade before they are permanently posted to the Q1 Report Card. I have spent the past two days making personal contact with any student who has below a C- in history to make sure they clearly understand what they have to do to improve their grade. Most of the time, it's missing or absent work that can easily be turned in for either partial or full credit. EVERYTHING is now up-to-date in the gradebook, except for work that was just given to me today. This would also include the extra credit that was turned in for Periods 4, 5, and 6. I will enter that this evening. If you have any questions, please e-mail me at my personal e-mail address (rippolito@gmail.com). You can also text me at (661) 347-4990. We're down to the wire here, so as long as you send me a message tonight by 9:00 p.m., you will get a response back tonight. Today in Mr. Ippolito's class we watched a Nova special called "Cracking the Maya Code." We then learned more about the Maya Civilization from our textbook and worked on the "Maya Civilization" handout, which goes on page 32 of the INB. Your homework for tonight is simply to complete the "Maya Civilization" assignment that we began in class. In mrippolito.com, please scroll down to the blog post right below this one to participate in the BONUS activity for today! Did the Maya really predict the end of the world? Did the Maya really predict the end of the world? Is the world really going to end in December 2012? Comment on this blog post to let us know what you think. To qualify for the bonus, make your comment by next Wednesday, October 20. We had two additional minimum days thrown at us after the A-B block schedule had already been set for the year. One is at the end of the first quarter (this Friday) and the other will be at the end of third quarter (in March). Because the A and B Block Days were already set when we got this new schedule, we needed to figure out how to take Friday's A-Day and Monday's B-Day, and make them as equitable as possible so students have the maximum learning time. Here is our solution: Friday will be an A1 day with Periods 1 and 2 only. Next Monday will be a B3 day (it sounds weird, I know). Enjoy! This cartoon was produced in 1960, and is a wonderful example of the classic view of Christopher Columbus. "Is Christopher Columbus a hero or a villain?" and that was the journal assignment that we worked on today. There are a couple things I want to share with you. Included are two articles, one from conservative columnist Daniel Flynn in defense of Columbus, and then an excerpt from A People's History of the United States, by liberal author Howard Zinn. So, is Christopher Columbus a hero or a villain? Place a comment on this blog and make your voice heard! Oh, by the way, there is no NEW homework assigned today. Make sure you have the "Mesoamerica" vocabulary assignment ready for the next block day. Sorry again about the BrainPop confusion. Apparently, our username and password allow unlimited students to login AT SCHOOL between 7:30 am and 5:30 pm. Of course, our internet connection at school is so slow that we barely have enough bandwidth for teachers to log onto BrainPop. Anyway, enough of my complaining about our slow network. Here's the video we watched today in case you were absent or you simply want to watch it again. Enjoy! So I guess I misunderstood our BrainPop account. Oops. You won't be able to have the at-home access to BrainPop that I thought. I will find another way. Stay tuned . . . I know it has nothing to do with history, but I was amazed that this guy has produced all these helpful videos! It was a pretty simple, straightforward day. Along with the "African Proverb" projects (which I still need to finish grading), these are the final grades of the quarter. The homework for tonight is simple: Do something nice for your parents. Speaking of being nice, I am nice enough to offer an exam re-take on the benchmark. :-) If you get below an 80% on the benchmark exam, you will have one chance to re-take the exam, on Wednesday, October 13, at lunch. I grew up watching Sesame Street, as I imagine you may have as well. I enjoyed watching this season's opener with my daughter, and thought I would share this with you. Comment if you like this vid as much as Mr. Ippolito and his daughter did! Benchmark Review Podcast NOW ONLINE! yesterday. Hope everyone has a great Fall Break! Last night a malfunction occurred which appeared to affect student, staff, and parent logins for Infinite Campus. As a result, users were locked out after three unsuccessful attempts. As of 8:30 a.m. Friday morning, the Hart District IT Department announced that the issue had been resolved and all locked-out logins have been reset.